Association ” Center for Sustainable Community Development ” in Debar is a voluntary , non-profit , non-governmental, non-partisan association of citizens , formed by free association of citizens to exercise , protect and align their interests and beliefs to promote civil society and local communities, and to perform the activities for promotion of moral values ​​, strengthening of inter-ethnic relations and economic development in the territory of Macedonia and abroad , and in accordance with the Constitution and law . Every person has the potential to act as a citizen and advocate for his or her needs. Therefore, we create ways to strengthen and empower people in order for them to participate actively in the development of the societies they live in. Identifying the main issues of interest by the local community and take action to improve any deficiencies occurred in Debar region and to facilitate and mediate the dialog between the parties and community. Resources: Office, Meeting room, IT equipment, internet, library. EU info Point..
Services: Consultancies , training, logistic, expertise, translations ..
Association ” Centre for Sustainable Community Development ” in Debar , acting on the territory, and organize the area of Debar Association in its operation can be expanded nationwide and can cooperate with organizations , associations , foundations and institutions , and to belong to associations at home and abroad in accordance with the Constitution and the Law of the Republic and the Constitution . Under the 1st area of the Civica Mobilitas grant our staff created several tools which provided support to our local society as well as our constituents who participate directly in our work and activities. We completed this project in order to realize our ideas and enact joint actions with our constituents. As a result of the financial support, we were able to attend important consultations and create lasting contacts both with Civicas staff and other relevant actors working in the field. Since working with MCIC staff we developed the institutional capacity and courage to continue providing and even adapt our services when our projects came under pressure and we faced challenges. Another thing that helped us in developing this institutional capacity was how we learned to track the existing situation, promptly inform our constituents, and ensure the continuity of our activities. All of these skills and tactics were supported by the use of the Civic Mobilitas brand and logo as the umbrella for us to work as a large family of organizations and individuals with clear ideas and a single cause. We gained community confidence, in our protests we can gather up to 2000 citizens, we get support from the associations from many cities in Macedonia, neighboring countries and from Europe. As a cause for the protection of the Radika River and the Mavrovo National Park, we also received support from the diaspora associations in Europe and America. Many media as local but also international like The Guardian, informed about ous activities us, interviewed us. During this period, we joined together with other associations working on the same theme in the region, combining ideas and activities to be more successful, with the association Ekos Svest, Euro Nature, Blue Heart of Europe, Friends of Vjosa etc. Through the grants second area we contacted, and worked with other organizations to conduct campaigns and activities to promoted the values which our organization holds dear and works toward every day. These include perseverance, the continued improvement and promotion of the values ​​that are characteristic of our region (respecting diversity, tolerance, solidarity), and a special aspect to promote good moral values. 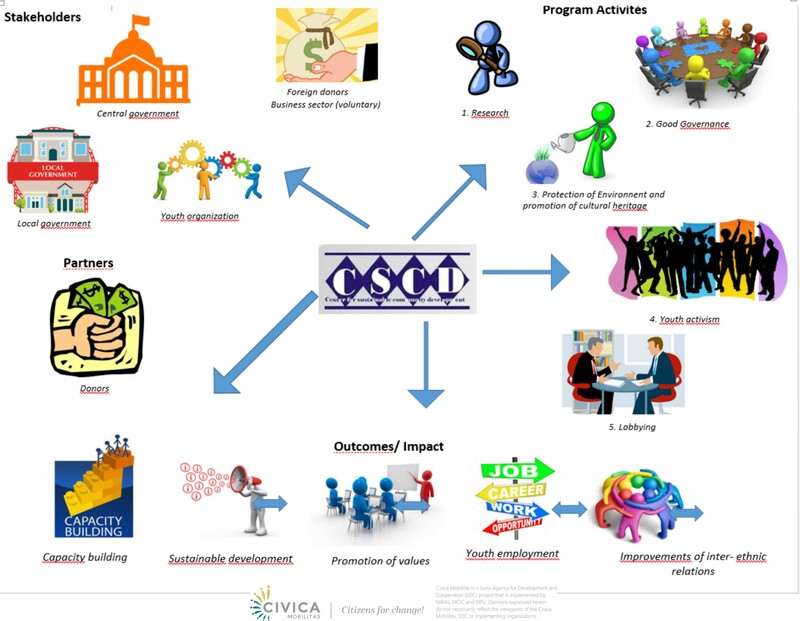 With support from Civica Mobilitas and in conjunction with these values, our organization conducted a number of activities to increase the transparency and accountability of public institutions, municipalities in order to implement the laws on the rights of children, youth, and marginalized groups. CSCD wants to improve any deficiencies occurred in Debar region by: identifying the main issues of interest by the local community and take actions to facilitate and mediate the dialog between the parties and community. The association works on raising trust and coexistence, recognizing discrimination, punishing violence, supporting freedom of speech, supporting the media, protecting protected natural treasures and cultural heritage, monitoring state institutions, supporting public civil debates with particular emphasis on youth debating. In order to achieve better results in this sphere, the associations make efforts to increase the number of constituents, to always give them support in exercising their rights and to advance the positive results achieved. We continually identify the major issues of interest to the local community and undertake activities to facilitate and mediate dialogue between the parties and the community. Our optimism for achieving the planned results is being transmitted to our constituents, in order to create an atmosphere of optimism and a sense of satisfaction. Our civil engagement is very broad. as an organization that has achieved renown and trust among the citizens, we are leading initiatives for change of politics at the local level, for each problem we emphasize our remarks and give recommendations for overcoming the problems. Local decision-making bodies or making various strategies and documents in the working groups appoint our members. according to our program areas, we have implemented a number of activities in the spheres of environmental protection, informal education of lords, support of young people for participation in decision making portfolios, assessment of labour market needs, protection of Internet users, violence, creation in a tolerated environment, inter-ethnic cohesion. Strengthening the cooperation between citizens, public institutions and the private sector is always our priority. In the city of Debar, we have achieved good cooperation results, and many common activities have been realized, and we can say that already have built some degree of social responsibility of private companies, here we can emphasize the company SLICE, which after several years partnership with us already it starts independently to carry out activities for the benefit of the community. 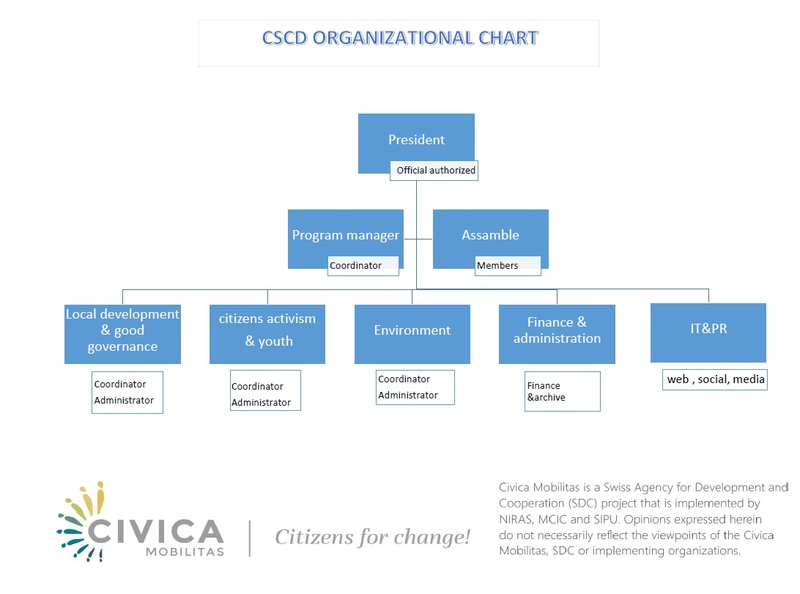 Through the support of the Civica Mobilitas program, we intend to create an organizational structure that will have the capacity for financial and administrative work, a functional website, cooperation with media, and the development of a strategy for the next 3 years. During this period, we have developed a three year strategy, we have developed a development plan, we have built a structure for better functioning of the association, especially administrative and financial operations. The staff, the members and the volunteers spent a lot of trainings, practices, and study visits, through which experiences were exchanged, new knowledge and experiences were gained. Our main goal was to work according to the laws of the Republic of Macedonia. Our association last year, as an organization that always ranks first in the demands for freedom, justice and democracy, was one of the 22 organizations that were under pressure from state control. But due to responsible, transparent and correct operation, the controls resulted in order, without any lows. We have arranged the website, we have a PR person, for promotion and transparency of the activities, we use the Facebook page, and for many, projects, initiatives, we create special facebook pages, groups, etc. our members attend regional and national conferences, in government workshops and other foundations for creating strategies, plans and documents, in which workshops we suggest our suggestions, ideas, etc. We have developed a project in partnership with other organizations in Macedonia, France, Albania, together with them we have published. books, brochures.